Trinity Lake in Northern California is a private getaway enclosed with tall oak and pine trees. There are many secluded coves and beaches where houseboaters can relax and take in the scenic beauty of Shasta Trinity National Forest. An abundance of wildlife makes this a great area for hiking, backpacking, mountain biking, and camping. Trinity Lake is only 17 miles long and 1-4 miles wide, but with 147 miles of shoreline, it is one of California's largest lakes. The lake temperature ranges from 46 degrees to 81 degrees F. In the spring, an array of flowers bloom around the lake and stunning colors also emerge in the fall months. Visitors to Trinity Lake enjoy a wide range of outdoor activities including swimming, water skiing, wakeboarding, horseback riding, and river rafting. Visitors can also take advantage of the nearby mountain ranges and go downhill skiing in the winter. The Scott museum and gold panning adventures are famous tourist attractions. 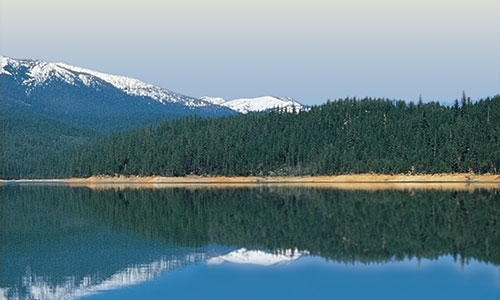 Trinity Lake is also well-known for excellent bass and trout fishing. Largemouth & Smallmouth Bass, Rainbow Trout, Catfish, and Kokanee Salmon are most commonly found in the lake. Cities close to Trinity Lake include Douglas City, Lewiston, Weaverville, and Redding, California. 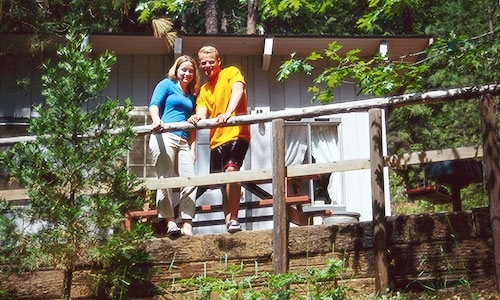 Trinity Lake Resorts and Marinas near Weaverville, California offers lakeside cabin rentals overlooking the Trinity Alps. They provide houseboats, powerboats, and fishing boats for visitors to rent. Its full-service marina comes complete with a restaurant and lounge in the main lodge building, a retail store, dry storage facilities, boat slip rentals, and a boat repair shop. This regional setting is also not too far from wineries. Check out the local Alpen Cellars where they produce award-winning white wines and have a tasting room. What better way to enjoy your magical Alpine sunset moment on your houseboat in your secluded Trinity Lake setting than sipping on a local Riesling or Gewurztraminer where the grapes respond nicely to the higher elevation and climate. In close by Weaverville, you will find stores to purchase local farm fresh organic produce, beef, chicken, wine craft beers and even sushi. All ingredients for memorable meals with loved ones and friends.